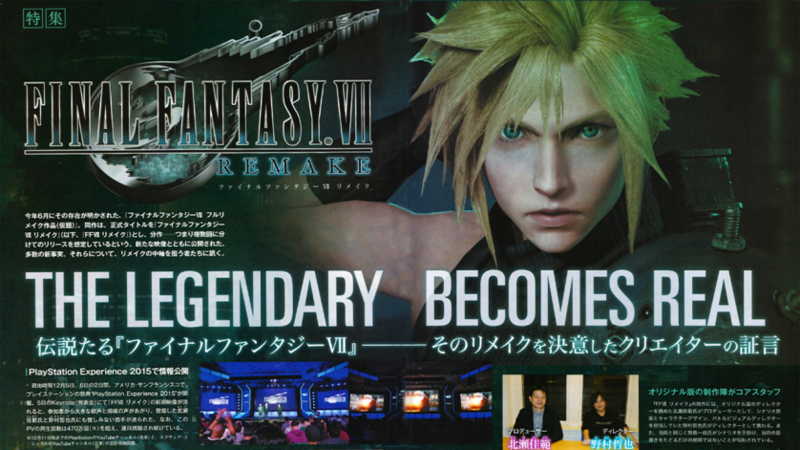 The latest issue of Japanese gaming magazine Famitsu (due to be released on 17th December) features another spread on the FFVII Remake, including interviews with key members of staff. According to Gematsu, it indicates that the scenario (originally by Kazushige Nojima) for Part One is complete, along with a few other new bytes of information. Stay tuned for a full translation with scans by forum member Hian when the magazine releases. Just hope Cloud’s hallucination scenes will add some from the scenes of Crisis Core. Glad to hear that some of the actors from Advent Children in Japanese are returning. I hope most of the English actors from the film will return too(and in Dirge of Cerberus and Crisis Core). Sad to hear that Nanaki’s voice is changing. Actually, the man who voiced Hojo said he would do him again. No way! Really? Where’d you hear that? I spoke to Paul Eiding on Facebook. I asked recently too, and he said he’s heard nothing yet. So…. I don’t know if they’ll be going with him or not… I hope they do. As much as I hated Hojo’s voice in Dirge of Cerberus. I love other works by Paul. Ah, I see. I know he voiced Hojo in the prequel Crisis Core too, and I hate Hojo’s voice too. In truth, I don’t see Paul actually returning.